Full Title: Opening Love: Intentional Relationships & the Evolution of Consciousness. 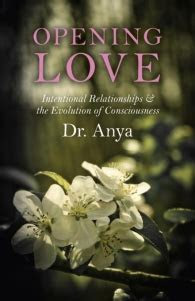 Opening Love explains Dr. Anya's views on polyamory and how this view works out from a spiritual stance. She likes these views as akin to the plight of the LGBTQ community, in that some still consider the individual's in this group to act without any modicum of morality. She adds that ethics are important (via consent and honesty) and that not all polyamorist's are swingers. If one wishes to pursue the lifestyle of polyamory, this is the book for you. Anya Light, PhD, is an intuitive life coach, lightworker, meditation teacher, Reiki master, and poet. Her book, Opening Love, demonstrates how intimate relationships are a profound doorway to spiritual awakening.